Detectives in Dundee are appealing for information following a robbery at a corner shop in the east of the city. 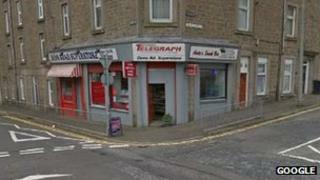 A member of staff was threatened by a man at the Dens Road Superstore at 11.10 on Friday morning. The man, who was wearing a dark-coloured hooded top and tracksuit bottoms, made off with a sum of cash. The female staff member was shaken but was unhurt as a result of the incident. Tayside Police are keen to speak to anyone who was in the area at the time. Meanwhile, the force has confirmed that officers investigating a robbery in Dundee's Loons Road at about 13:00 on Friday, 26 October, have charged a 31-year-old Dundee man.